Although I’ve traveled along the Eildon– Jamieson Road many times since the last 15 kilometres of dirt was sealed several years ago. I’ve never explored the actual township of Jamieson, even though it’s only an hour and a half from where I live in Marysville. Wanting to take my newly acquired 906 Paso out for a spin, I thought Jamieson would make a great destination for a late autumn club ride. Pete & Tim kindly offered to lead the ride from south Yarra to Lilydale, saving me an extra 2 hours of commuting. I arrived at Lilydale shortly after 10am as a few club members began to roll up. The South Yarra contingent arrived soon after bringing the total of bikes to 15. Stefan had a mechanical issue with the R1 when departing South Yarra and was planning to catch up with the rest of us along the way, so we waited a few extra minutes before departing the second pick-up point, just in case he was not far behind. With no sign of Stefan we headed off along the Maroondah Highway towards Taggerty. As we passed through the picturesque vineyard region of the Yarra Valley I realised the extra layer of clothing may not have been necessary given the very mild conditions. From Healesville we climbed into the mountains and over the Great Dividing Range. The trafic through the Black Spur was reasonably light for late Sunday morning, making it a pleasurable experience. We arrived at Taggerty where we stopped for a short toilet break and leg stretch before heading towards Eildon. Just as we were getting ready to depart, Stefan managed to catch up and rejoin the group. From Taggerty the ride continued to Thornton, catching glimpses of the Cathedral Ranges on our right. Almost at Eildon we arrived at the turn off to Jamieson where we regrouped before tackling the 64 kilometres of constant cornering through dense forest, sometime facing granite cliff walls and sheer drops off the side of the narrow road plunging many metres below. As described in a recent edition of Royal Auto – On the Eildon–Jamieson Road, nothing is constant. For almost the entire length the bike is in a left, right, left motion as the road uncoils over the mountains. With no speed advisory signs, riders are left to their own judgment of speed, and at times 80 kilometres an hour will never seem so fast as it does along some sections of this road. Rolf, “H” & Hamish took full advantage of permission to pass the lead rider along this section of road, and it wasn’t long before I lost sight of them rounding the next corner. We regrouped at a scenic lookout near Jamieson, offering sweeping views over Lake Eildon and the surrounding ranges, before we descended into Jamieson like a 747 on its final approach to earth. After being flanked by the soaring roadside eucalyptus trees we were greeted by brilliant autumn colors as the bikes lined up out the front of Debz Café in the main street of Jamieson. Given the mild and sunny conditions we opted to dine outside, spread across the front veranda and courtyard of the café. 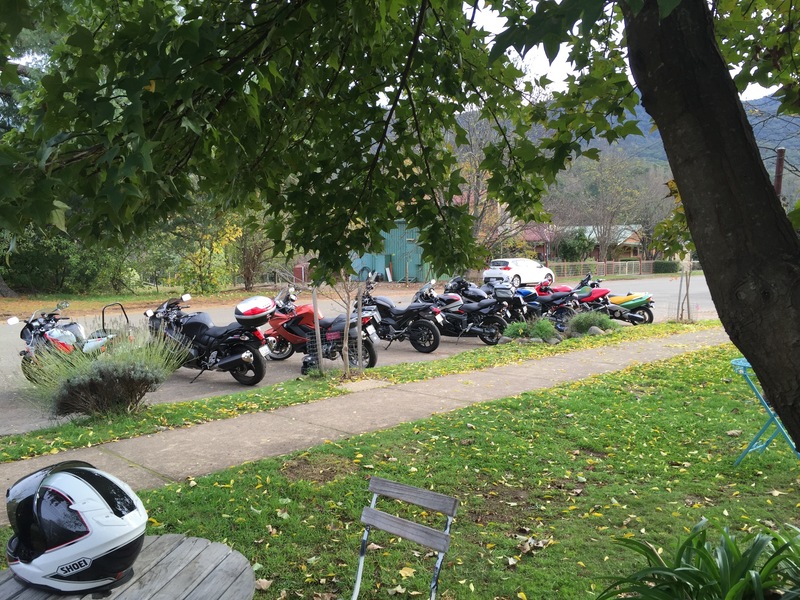 Our meals came quickly as riders reflected and regaled on their experience along the road that unravels along the southern boundary of the Lake Eildon National Park. So the most direct route was via Yea. Not necessarily my preferred option, especially given the new 80 kilometre speed limit between Molesworth and Yea, but time was now of the essence, and it did complete a full lap of Lake Eildon. Again, the delightfully mild conditions made this section of the ride quite pleasurable. a more thorough inspection. Myself, Dewy & Stefan were directed to pull over on the side of the road as opposed to the other vehicles who were breath tested on the main carriageway. With no ride leader the rest of the group continued along the Goulburn Valley Highway to Yea, while the three of us endured a license check, vehicle inspection, registration check and of course a breath test, all while the cop was furiously taking notes. At one point I thought his note pad was going to catch fire from friction heat. Too bad Vic Pol’s enthusiasm to pull us over didn’t extend to the courtesy of allowing us to continue on our way. It wasn’t until I asked “Can we go now” that permission was granted as he continued to take notes. Anyway, there were no issues, so that’s a good thing I guess. The three of us with tail rider in toe met up with the others in Yea, who were patiently waiting at the designated stop. Well done for following instructions! My intention was to continue along the Melba Highway to Coldstream, then finish the ride back at Lilydale around 4:30pm, but it seemed most were happy to make their own way home from Yea in different directions. So it was agreed by all that the ride would end in Yea, which suited me as well, meaning I wouldn’t have to go back to Lilydale unnecessarily. Unfortunately the Paso wasn’t back from a service so I was on the 749 which I was sort of glad when winding my way through the hills. The Paso will be on the next club run to Mirboo North, ironically where it’s lived all its life until I acquired it. Thank you to those who attended making it a great day, and special thanks to Pete & Tim for leading the ride from South Yarra to Lilydale, and Jay Cee (John C) for being tail end Charlie all day and even waited while the three of us were pulled over by the police. What diligence.